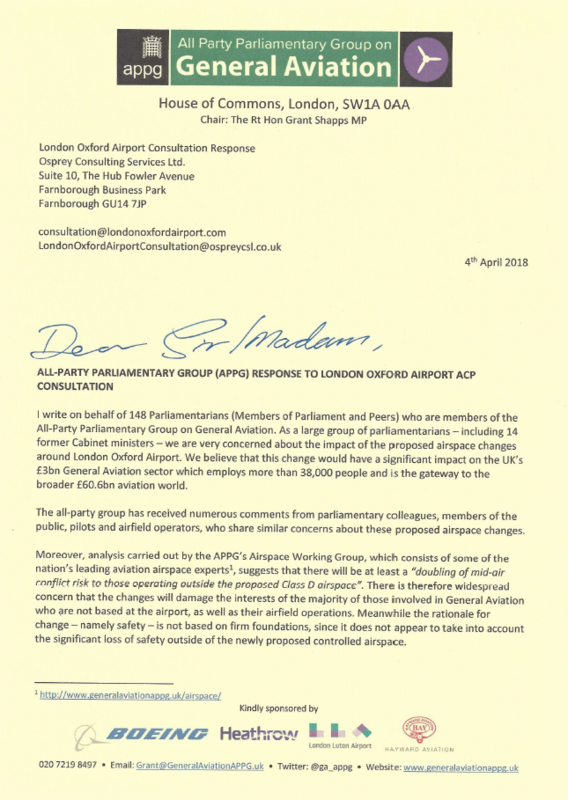 The All-Party Parliamentary Group (APPG) on General Aviation has voiced significant concerns about the potential dangers of proposed airspace changes around London Oxford Airport and RAF Brize Norton, branding the proposed changes ‘dangerous’. 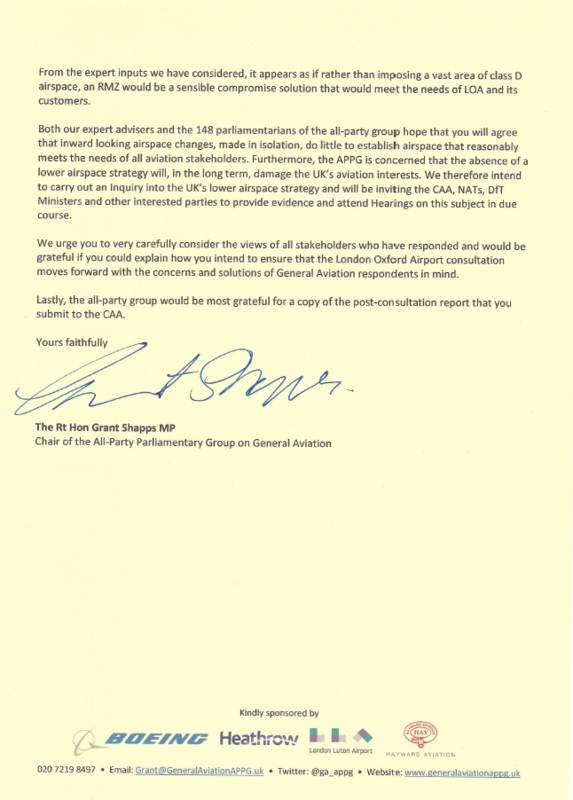 In separate submissions to the two consultations, the 148 parliamentary members of the all-party group said that there is “widespread concern that the changes will damage the interests of the majority of those involved in general aviation,” and that the rationale behind the proposed introduction of large scale Class D controlled airspace does not appear to take into account the resulting significant reduction in safety outside of the newly proposed controlled airspace. The parliamentary group has been contacted by colleagues in Parliament, members of the public and a wide variety of airspace users. All share similar concerns about the impact on general aviation, including increased dangers in the region’s remaining uncontrolled lower airspace. 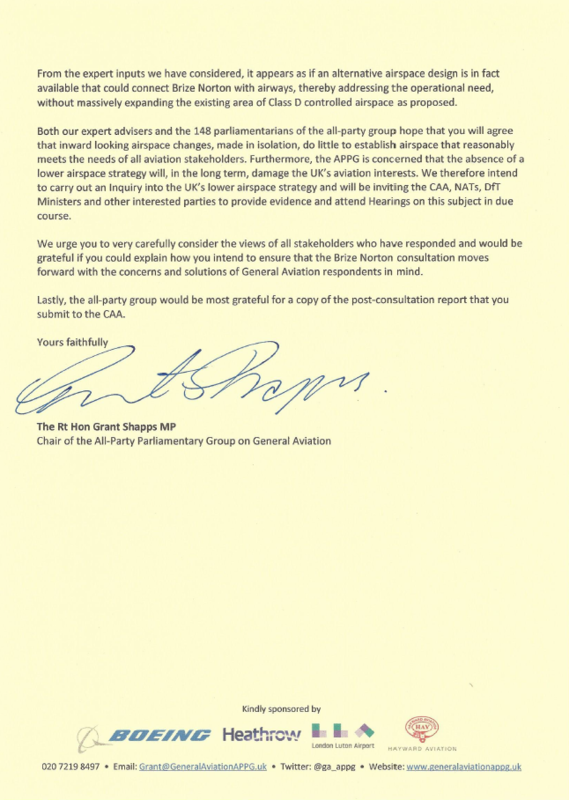 Investigating in order to submit the APPG’s formal response to the two consultations, experts on the all-party Airspace Working Group have identified alternative airspace designs in both cases. These would address the operational needs of both RAF Brize Norton and London Oxford Airport, without vastly expanding the existing area of controlled airspace. In addition to responding to the two consultations by the 5th April 2018 deadline, the Airspace Working Group has said that it will conduct an inquiry into the UK’s lower airspace, which will involve a Call for Evidence from industry bodies such as the Civil Aviation Authority (CAA), NATS Holdings and the Department for Transport. A report to ministers will be produced after Hearings in due course. 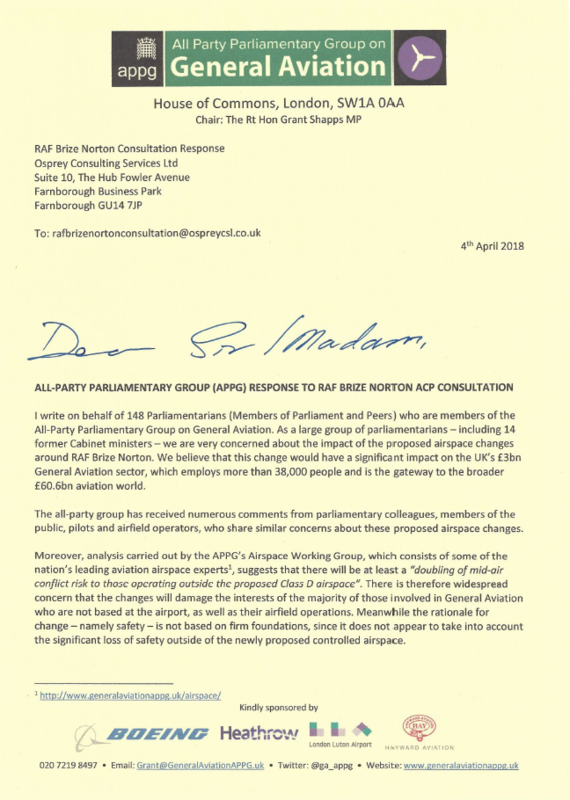 Chair of the All-Party Parliamentary Group, The Rt Hon Grant Shapps MP, said: “The all-party group on General Aviation has received large numbers of concerns about the proposed airspace changes around London Oxford Airport and RAF Brize Norton. There is something rotten with the current process, which is why a new procedure has already been introduced. The attempt made by these two applications to get under the radar by using the previous rules is not acceptable to those of us in Parliament. The two APPG consultation response letters are shown below. The Airspace Working Group is comprised of some of the UK’s leading aviation airspace experts. The work programme for the Group can be found here: http://www.generalaviationappg.uk/airspace/.